Ballochdale Estate Vineyard came to be when Garry Neill, a person from a family with a long history of farming (130 Years ) and liquor industry association (150 years), teamed up with his wife Sara and a group of investor wine enthusiasts, mostly based offshore, to create an entity to produce the highest possible quality wines from this very special site. We were lucky that in owning the land we had the privilege and time to spend several years researching into assessing the site for its suitability of growing grapes including monitoring of temperatures, taking advice from many experts and a careful analysis of the soils. Pinot Noir is now the absolute stand out grape variety for this vineyard and the Sauvignon Blanc has also contributed gold and double gold medals. It is a unique site in its own right and it is not until you visit that you come to appreciate the magnificence if the situation and suitability to grow some of the finest. 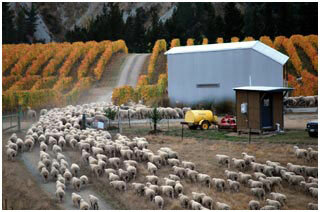 It is also a site well suited to the growing of a quality Awatere Valley Sauvignon. © 2019 Copyright Ballochdale Estate Ltd. Photographs by Garry Neill . All rights reserved.